Not one I’ll rush out and buy, then! 🙂 I think you could safely give this one a miss. The title of this post had me rushing to read it, but the post itself does not inspire me to pick up the book, much. I admit it’s made me a little curious, and if I ever come across a copy of it, I might be tempted. But not curious enough to pay $20! Sometimes the worst books make the most entertaining reviews! Well. Of course I remember hearing about this book a million years ago. Because my stepmother, Helen, told me about it. Because it was written by her boss at the London Free Press. No, I never read it, and thank goodness I didn’t borrow her copy. Thanks, I think, for reading it for us and reporting. Or not. Um…. The Last Amercian?? In translation, I take it. Small world! Thanks for sharing that connection. In the book’s defence, it was a fast read. 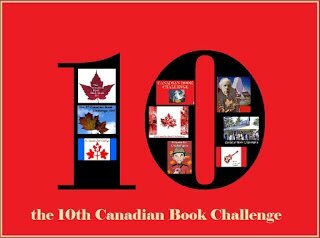 And I got to add it to my Canadian Reading Challenge list. And it led me to several very funny reviews by others who shared my “What the ?? ?” reaction. I did go on to read some very different things as a sort of antidote. Gabrielle Roy and Margaret Craven – at the far other end of the spectrum! Great review. Glad you finished it so you could entertain us all. Bad, stupid and strange – stranger still when one considers it was penned by the editor-in-chief of a fairly large newspaper (Canadian scale). And to think he didn’t use a nom de plume! 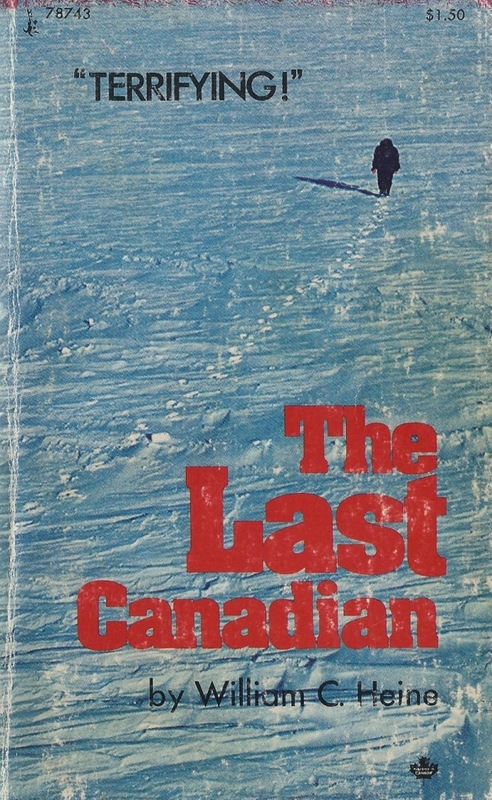 As you know, I first read The Last Canadian as a pre-teen, but remembered next to nothing. Now, five years after rereading it, I feel I haven’t forgotten a thing. The only explanation I can offer was that as a pre-teen most of my reading focussed on superhero comics. There is a similarity, I think. Someone should bring this back into print. Someone else should adapt it as a graphic novel. Both are moneymaking ideas. It’s always interesting to read other’s thoughts. Thank you. Re-reading our teenage-era books is an exercise fraught with all sorts of surprises, isn’t it? In my teen years, I myself read a vast amount of science fiction (among other things, including a respectable number of the Great Russians) and even though I remember being critical of the more bizarre elements of the sci-fi genre, I had a very high tolerance for shaky plots as long as the story and characters were reasonably engaging. Re-reading Robert Heinlein is a case in point. 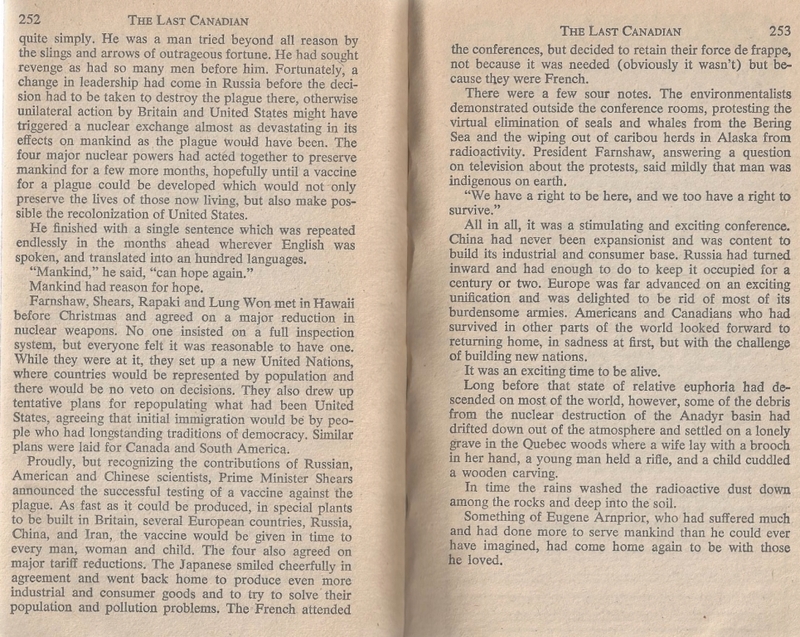 The Last Canadian reminded me strongly of Heinlein’s Farnham’s Freehold, which, though it has its occasional diverting moments, struck me as being deeply awful and ludicrously plotted when I recently re-read it. Shows the same sort of disconnect from plausibility. So there was a hardcover edition. I wondered. I’d definitely pick one up if it appeared in my travels – though I think my top price would be in the $20 range versus $150+ – it has a definite curio value. Heine’s more “serious” books sound more appealing on a “normal” level – the Shunpiker‘s books – about travel off of the main thoroughfares – might reward investigation. Also a memoir regarding his experiences as a newspaper editor. Might follow up on some of those. Bahahahaha, oh Lord, this was such a wonderful post. Where on earth did you hear about this book? It sounds completely bonkers! Random find at used bookstore. How could I resist, with a title like that? The loopiness was completely serendipitous. 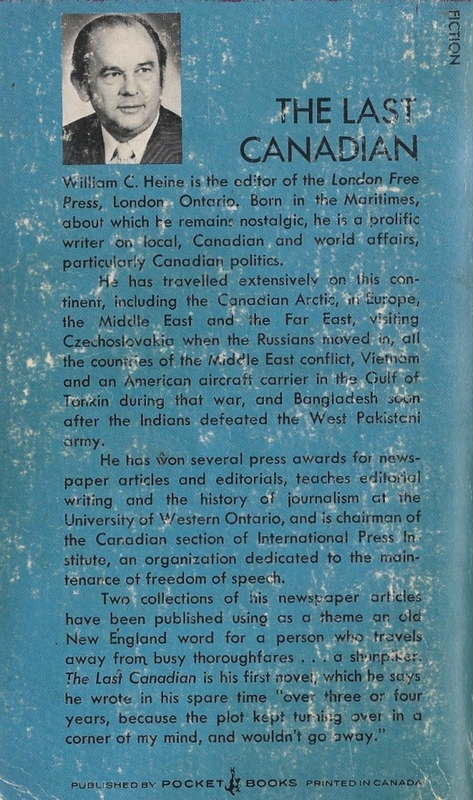 Especially surprising because I’d read the back cover author bio, and expected something a little more sedate, seeing that the author was the very respectable editor-in-chief of a major Canadian newspaper. Not expected! An entertaining review. Reminded me of other forgettable (but not-quite-forgotten) novels of long ago — Exxoneraton by Richard Rohmer, The Moon Pool by John Ballem, Murder on the Mackenzie by Jim Lotz. 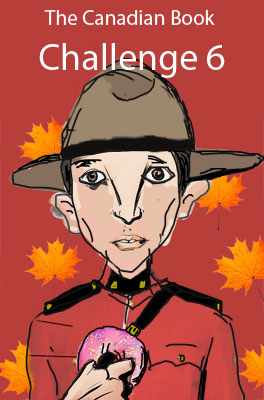 Maybe a suitable reading challenge — the worst Canadian novel? Or is that too unkind? Having read both – twice! 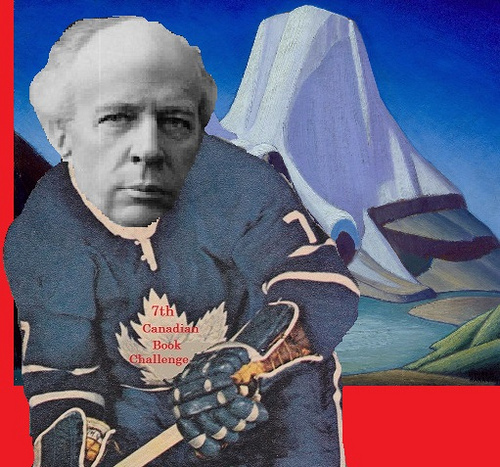 – I’m confident that The Last Canadian is worse than Exxoneration. That said, Richard Rohmer has produced a worse body of work Heine, if only because it is so much larger. 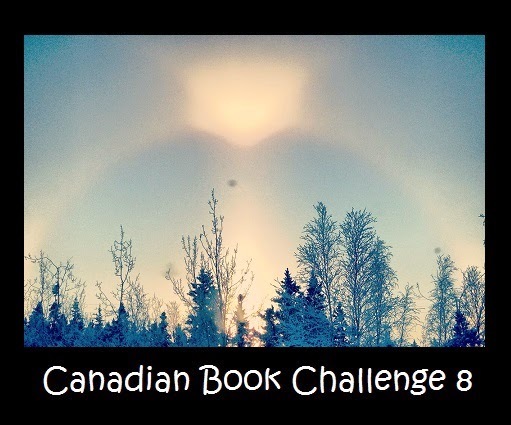 (I write this as I struggle through The Arctic Imperative, the twenty-third volume tackled in the Reading Richard Rohmer challenge).